In an obvious affront to the 4th Amendment, a new ruling from the Supreme Court states that cops can pull you over and search your car based only on an anonymous tip – no other evidence is needed. The ruling is from case Prado Navarette et al vs. California and drastically opens up the potential for abuse from law enforcement as anyone with a grudge can call 911 and have your car, or anyone’s car matching the caller’s description, pulled over and searched. “The Court’s opinion serves up a freedom-destroying cocktail consisting of two parts patent falsity: (1) that anonymous 911 reports of traffic violations are reliable so long as they correctly identify a car and its location, and (2) that a single instance of careless or reckless driving necessarily supports a reasonable suspicion of drunkenness,” Scalia wrote. Five Supreme Court justices believe that this is constitutional. Justice Clarence Thomas believes that the 4th Amendment allows what he calls “brief investigative stops” of vehicles. “The traffic stop complied with the Fourth Amendment because, under the totality of the circumstances, the officer had reasonable suspicion that the truck’s driver was intoxicated,” Thomas wrote. Little by little we are seeing our Constitution torn to shreds! Pretty soon there will be nothing left of it and we will be living under a lawless society where the only ‘laws’ are what our politicians, who are owned by big banks and corporations, tell us what we can and can’t do. The Supreme Court has ruled that police only need an anonymous tip – and no other evidence — to pull a vehicle over and search it, the United States Supreme Court has ruled. The ruling in a case called Prado Navarette et al vs. California drastically expands law enforcement’s ability to stop vehicles. During the stop the California Highway Patrol found 30 pounds of marijuana in Navarette’s truck and arrested him. The ruling divided the Supreme Court’s conservative bloc, with Justice Antonin Scalia – a leading conservative – writing the dissent. He wrote a scathing dissent and said the ruling sets a precedent that could be a major threat to individual freedoms. Scalia alleges that a person who had a grudge, for instance, could call 911 and falsely charge drunken driving in order to get that person pulled over. To make matters worse, police could pull any vehicle over that matches the description. This could make it easier than ever for law enforcement to stop vehicles and confiscate cash or guns. Five Supreme Court justices believe that the highway patrol’s actions did not violate the Fourth Amendment’s prohibition on unreasonable searches and seizures. In the majority opinion, Justice Clarence Thomas wrote that the Fourth Amendment allows what he calls “brief investigative stops” of vehicles. “The traffic stop complied with the Fourth Amendment because, under the totality of the circumstances, the officer had reasonable suspicion that the truck’s driver was intoxicated,” Thomas wrote. Navarette’s attorneys argued that the stop violated the Fourth Amendment because it was based on an anonymous tip. Thomas noted that the 911 call that led to the arrests of Navarette and another man came from a woman who claimed to have been run off the road by a drunk driver. Thomas also wrote that police have the right to pull vehicles over and search them when they have reasonable suspicion of criminal activity. The Navarette decision gives police a blank check to stop any vehicle anytime as long as they have an anonymous tip, Scalia charged. He also alleged that it could threaten Americans’ freedom of movement. “After today’s opinion all of us on the road, and not just drug dealers, are at risk of having our freedom of movement curtailed on suspicion of drunkenness, based upon a phone tip, true or false, of a single instance of careless driving,” Scalia concluded. Some of the recent incidents of police stops and searches of vehicles reported by Off the Grid News indicate that Scalia’s concerns are valid. 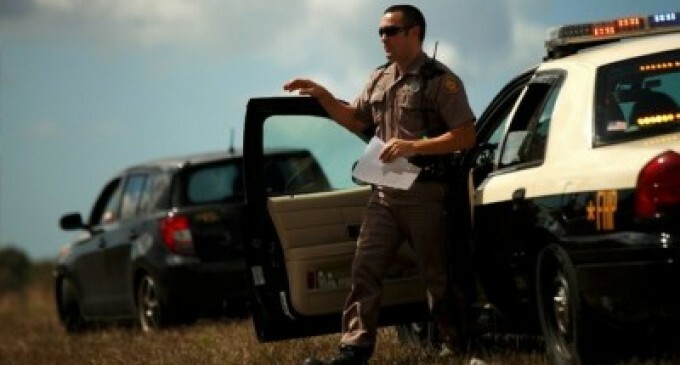 Drivers around the United States have reported having vehicles searched on questionable grounds and having cash, guns and other assets seized by officers without warrants. Justices Ruth Bader Ginsburg, Sonia Sotomayor and Elena Kagan joined Scalia in his dissent. Chief Justice John Roberts and Justices Anthony Kennedy, Stephen Breyer and Samuel Alito joined the majority opinion written by Thomas. THIS!!!!! THIS is why it is so incredibly imperative that we elect constitutional conservative PRESIDENTS! THEY are the ones who appoint the Supreme Court justices, and it is for LIFE.